The MFB Dominion 1 Analog Synthesizer is a 37-note paraphonic synth featuring 3 VCOs and 2 ribbon controls. The MFB Dominion 1's programmable design allows you to utilise the warmth and richness of the analog sound, combined with complex modular patching. At the heart of the Dominion 1 synthesizer are three VCOs, with each providing sliding variations in waveforms. Also included is a 128 stage step sequencer with 128 programmable patches and sequences. The velocity-sensitive keybed features aftertouch for fluid playability. The synth also includes an integrated arpeggiator, noise generator and analog/digital ring modulator. 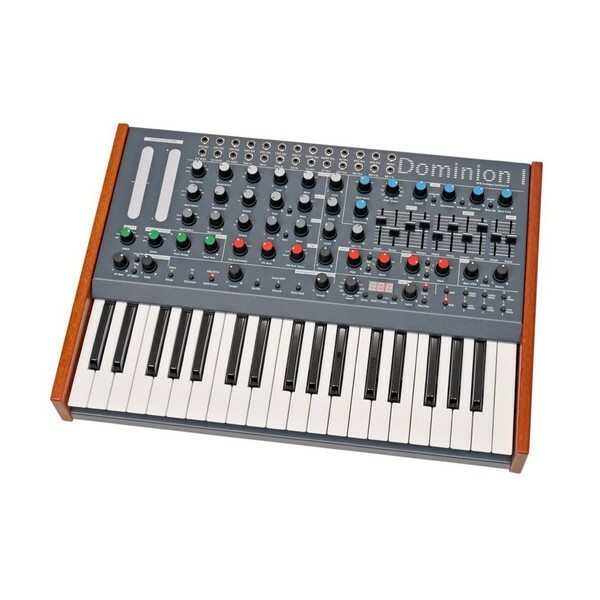 The MFB Dominion 1 is programmable paraphonic analog synthesizer featuring a 3 octave keyboard. The Dominion 1 Analog Synthesizer features 3 VCOs in total, that allow you to shape the waveform and utilise sliding variations between them. The ability to slide between waveforms, gives you virtually endless possibilities when it comes to creating sounds. Combining the warmth and grit of the analog circuitry with powerful modular patching, the MFB Dominion 1 delivers a truly unique synthesis experience. 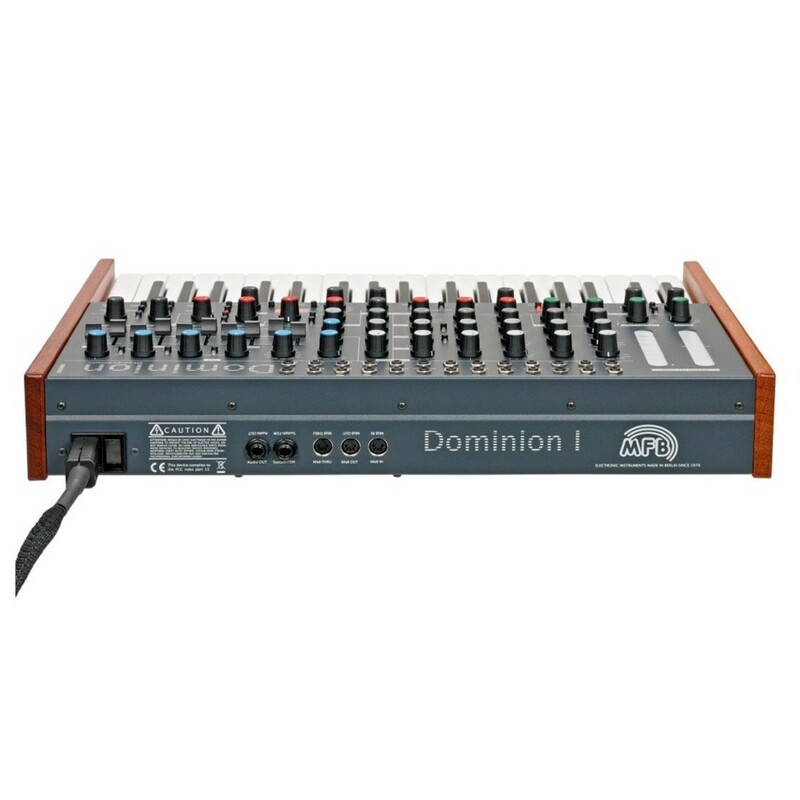 In addition to the varied waveforms, the Dominion 1 features two ribbon controls. The two ribbon controls can be assigned, allowing you to create changes in pitch and modulation by sliding your finger. It also boasts 12 operation modes for the on-board filters. The filters are comprised of four LPF with variable dB/octave slopes, two HPF, band bass and notch filters (with variable cut off slopes). The dual LFOs includes six waveforms in total, as well as sample and hold controls for the VCO, VCA and VCF. The modulation controls are assigned by using the selectors switches, allowing yout o easily set and r-route internal modulation paths for live performances. 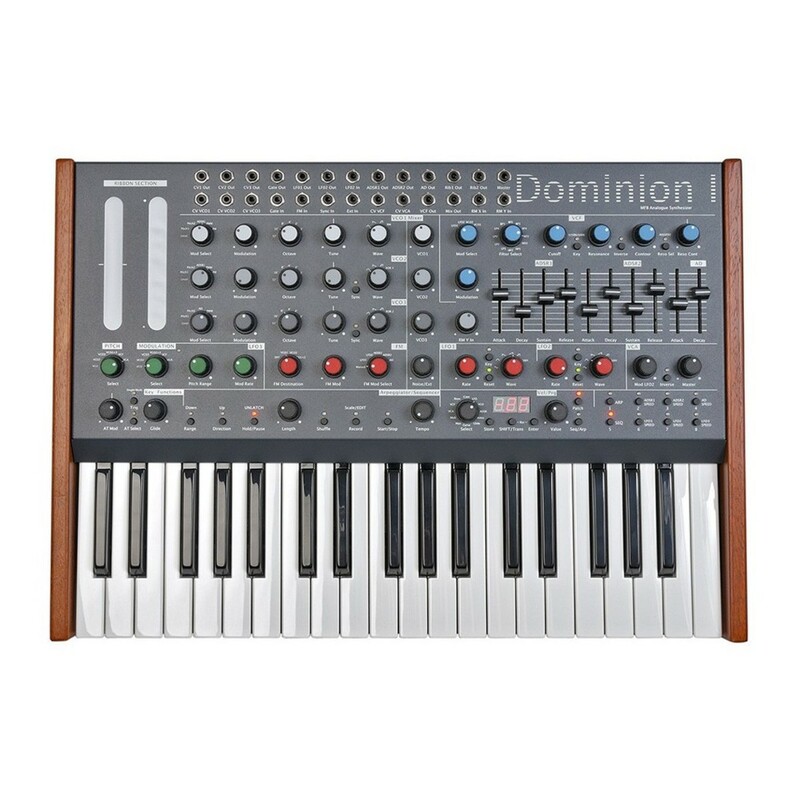 The Dominion 1 Analog Synthesizer also includes an arpeggiator and sequencer section for creating rhythms and sequences. The 128 stage step sequencer allows you to create complex rhythms and patterns on the fly, with 128 programmable patches and sequences in total. It also includes analog and digital ring modulation for added control. Other parameters include a noise generator, dual-sync and dynamic FM as well as 3 envelopes with 70mm faders for optimal control over every aspect. The MFB Dominion 1 Analog Synthesizer’s road-worthy design makes it ideal for studio and live applications alike. The robust layout includes colour-coded rotary-style controls for virtually every aspect of your controls. Also included is a range of 70mm faders for Attack, Decay, Sustain and Release. It also features a wide range of analog and digital connectivity including a huge patchfield locating on the top-panel modular and CV/gate connections. Also included is MIDI Dump, In Out, Thru for connecting to external equipment such as sequencers, computers and more. The sleek yet stylish design boasts rich wooden side-panels and quality hardware with an internal power supply.